The need to implement material handling automation for factory and warehouse logistics is an obvious step on the Industry 4.0 path. AGVs (Automated Guided Vehicles) and AMRs (Autonomous Mobile Robots) can provide tremendous improvements in productivity and throughput. But figuring out exactly how many, what type, how much battery capacity, changes to floor planning and many other consideration can be a daunting task. Which is why a digital twin should be your first weapon when tackling this critical planning task. With the right digital twin in hand, AGV / AMR vendors and their clients have the perfect tool to capture requirements, explore scenarios and measure ROI. A digital twin is a digital replica of a physical asset, where “asset” can be any machine, component or even worker in a factory or warehouse. Historically, digital twins were 3D or 2.5D models that run in CAD simulation tools. A 3D simulation tool can produce incredibly realistic rendering while mirroring the behavior of the physical asset. But these types of digital twins are not useful when trying to analyze material handling across a entire fleet of AGVs, due to the combination of very long simulation times, computing resources, huge modeling efforts and expertise required to use them. 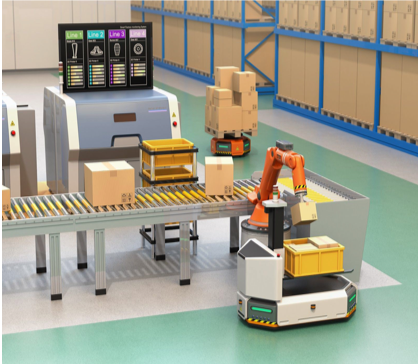 Fortunately, a new class of digital twins, specifically designed for logistic and material handling process automation, have begun to emerge in the market. These twins address unique aspects of logistics automation equipment, such as AGV/AMRs, AS/ARs, conveyor systems, etc. As such, they are uniquely designed to aid AGV/AMR suppliers and their clients during the phases of planning, deployment and live optimization of an AGV fleet. Unlike traditional 3D / 2.5D CAD tools, these new solutions are designed to be used by anyone, without the need for complex modeling or simulation expertise. This enables everyone to participate in uncovering the requirements of a client’s complex factory layout and production scenarios. A digital twin for material handling systems provides a fast, dynamic and rich medium for suppliers and their clients to collaboratively find optimal automation solutions that are qualified based on measured ROI and KPI improvement, across a broad range of scenarios. Let’s walk through 3 easy steps to illustrate the process of creating a material handling digital twin for production logistics planning. Capture your customers’ environment & requirements (layout, existing material flow, KPIs), by sketching or uploading existing 2D plan from popular CAD / drawing into the host tool for your digital twin. It’s important to focus on just the key aspects impacting material flow. 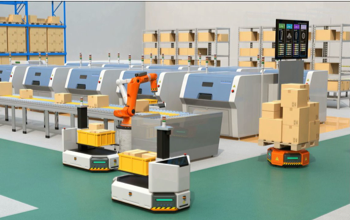 Tools that target logistics automation provide libraries of objects, such as AGVs, Conveyors, AS/ARs, Palletizing Robots and factory workers. Objects in the library can be pre-configured, enabling quick drag, drop and connection to explore and analyze material flows. These types of libraries can significantly reduce the time required to capture your twin and start getting answers. 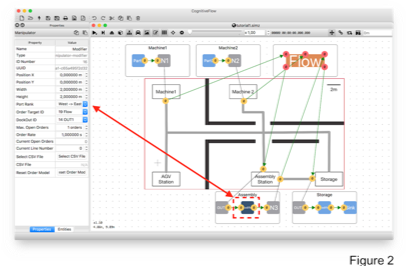 Beyond capturing the operations, Digital Twins provide a mechanism to easily define logic components (“manipulators”) including sources of products, buffers to store products, distributors to e.g. sort products or distribute them, and sources to take products out of the material flow form the material flow and are grouped into objects to model e.g. a machine. A logistics digital twin should be interactive and dynamic. Avoid at all cost, digital twins that require recompilation, re-start and re-run if a change is made to the design and/or design parameters. An interactive digital twin will continuously run while simultaneously utilizing the latest input and data available. Just like a factory runs non-stop – your digital twin needs to do the same. Dynamic interaction is not only extremely useful during the “what if” planning phase, but it’s absolutely critical for deployment and optimization. The latest generation of Digital Twin architectures enable dynamic, interactive modification during runtime. Once the initial design is captured and running, users can explore “what if” questions within the design and instantaneously observe the impact on Material flow and KPIs. This iterative approach makes it easy to start with a simple design and then expand it to increasingly complex dynamic material flows, which can be continuously visualized and modified. In all variants, users can quickly observe the real world flow and validate the assumptions regarding throughput, number of AGV units used and traffic scenarios. 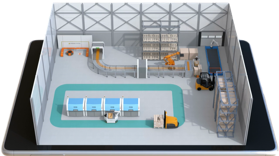 Digital Twins for material handling are best when hosted in a dynamic 2D representation to mimic a birds eye view of production logistics within a factory or warehouse. Animated the 2D visualization provides an intuitive way to understand the interaction between AGV fleets within the clients’ material flow. Figure 2 is an example of a 2D view of a simplistic Digital Twin. With dynamic visualization, KPIs such as throughput and OEE can be continuously monitored. This simplifies impact analysis of increasing or decreasing the number of AGVs or changing other related parameters (like trajectory paths, waiting delays, processing times, AGV load capacities, AGV velocities, even their physical dimensions. This is a very productive approach to quickly determine the optimal number of AGVs needed for any logistic environment. Consider real world scenarios such as two alternative pathway options for an AGV. ➢ Does not allow bi-directional AGV traffic due to the width constraints of the pathway. This is a classic type of scenario that should be considered early in the process of logistics automation. The KPI impact of each path option may be significant. Again, a digital twin is the perfect way to identify every optimization opportunity, early in the process, where changes to factory layout are easiest to make. Analysis is key to understanding system wide trade offs. We’ve shown how dynamic visualization can help users easily identify bottlenecks as well as the speeds and capacity of the material flow handling contributing to the bottleneck. Expanding the number of AGVs in the fleet may resolve bottleneck, but that same increase in active AGVs may also cause other, unexpected bottlenecks, such as AGV queuing, which can ultimately REDUCE overall throughput, as shown below. A system wide, statistical view of the material flow, as calculated by the digital twin, can make it easier to understand the system wide, cause and effect of changes to the design. Beyond Planning. Deploying with a Digital Twin. If you’re an AGV vendor and you’ve followed this example, you have determined the size and configuration of the AGV order. Both you and your client worked collaboratively to find the optimal configuration. It’s time to deploy and you want nothing more than a smooth deployment process. Fortunately, you can help your client smoothly deploy, by re-using the configuration captured in the digital twin, which can be used for ongoing material flow analysis and optimization within the factory. The new digital twins for material handling are designed with live control systems in mind. 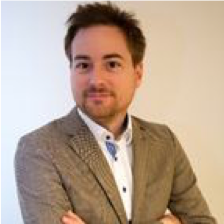 The same data model used for analysis and optimization can and should also be used to enhance operations and management, augmenting fleet managers and MES/WMS solutions. Autonomous vehicles by definition change the material flow continuously. A dynamic digital twin with proper integration can enable continuous analyses and prediction of the most efficient scenarios and optimization opportunities. Integrating the digital twin with the AGV fleet manager, insures each vehicle is continuously assigned the most optimal mission, realizing the highest throughput and AGV utilization. KPIs analytics update continuously, responding to system wide changes. By having the common model between optimization, deployment and management and real time synchronization with the fleet manager, you can perform rapid and ongoing exploration of scenarios that are connected to the real world – a true material flow digital twin.